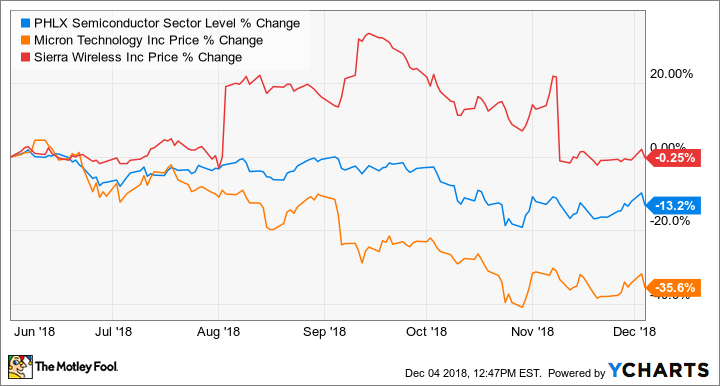 Which of these two stocks will beat the semiconductor slowdown? Chip stocks have fallen out of favor on Wall Street of late. The Philadelphia Semiconductor Index has slid over 13% over the past six months as fears about an industrywide slowdown have spooked investors. Not surprisingly, the broad market sell-off has hurt high-flying chipmakers Sierra Wireless (NASDAQ:SWIR) and Micron Technology (NASDAQ:MU), both of which are currently trading close to 52-week lows. Clearly, Micron has been the bigger loser of the two as it is believed that a potential oversupply in the memory industry will eat heavily into the company's margins. Sierra, meanwhile, has run into a speed bump as it expects growth to slow down in the current quarter thanks to component shortages stemming from U.S. tariffs on goods imported from China. However, both chipmakers have been pursuing lucrative opportunities such as the Internet of Things (IoT), and could prove to be solid long-term bets once the near-term headwinds fade. But one company enjoys a clear advantage over the other and could give investors a safer path to growing their wealth in the long run. Internet of Things specialist Sierra Wireless hit a nice stride earlier after its growth hit a higher gear. The company sustained that momentum in the third quarter (that ended in September) as its revenue growth rate improved, but its guidance was disappointing. Sierra expects its top line to grow 11.2% annually during the current quarter. Analysts originally anticipated that the chipmaker would deliver 13.5% year-over-year revenue growth this quarter, and also improve its earnings from $0.28 per share last year to $0.32 per share this time. Sierra called instead for earnings of $0.26 per share at the midpoint of its guidance range. Investors were quick to punish the tepid guidance, but they seem to be missing the bigger picture in the process. Sierra has been hamstrung by near-term supply-related challenges that will negatively impact its top- and bottom-line performance this quarter. The company is, however, pulling the right strings from a long-term perspective to attack the IoT market with greater efficiency. For instance, Sierra's IoT services business nearly tripled last quarter thanks to the acquisition of Numerex. It now supplies just over 11% of Sierra's total revenue, which means that the company has already exceeded its target of increasing the recurring revenue from its services business to 10% of its total revenue. Sierra can go a step further here as the IoT services market is estimated to grow at a compound annual growth rate (CAGR) of 24% in the coming years. The notable thing here is that the IoT services business isn't Sierra's only catalyst. Its OEM (original equipment manufacturer) solutions business is going to get a shot in the arm from next year onward once new contracts start contributing to its top line. Volkswagen, for instance, will start deploying Sierra's modules in its cars from next year, while other IoT customers are looking to accelerate their usage as well. Sierra should be able to put its business back on track in 2019. More importantly, it is capable of delivering robust long-term growth thanks to its market-leading position in cellular IoT modules. The company commands nearly a third of the global IoT cellular module market, which is a great place to be in as this niche could grow at nearly 22% a year through 2024. Micron Technology made its investors a lot of money when memory prices were rising, but it seems to be losing that advantage now. Prices of dynamic random access memory (DRAM) are going to drop on the back of an increase in supply and limited demand. DRAMeXchange estimates that DRAM average selling prices increased just 1% to 2% in the third quarter, and they are on track to decline around 5% in the fourth quarter. This is bad news for Micron because 70% of the company's revenue and 75% of its gross profit comes from the DRAM segment. History is proof that weak DRAM pricing can wreak havoc on Micron's financials, and it won't be any different next time as the company has to keep incurring a lot of capital expenditure to maintain capacity and remain competitive in a cutthroat industry. So, when memory prices drop and capital expenses remain high, Micron's profits take a massive beating. That's why Micron has lost a lot of value of late, as investors have thought it best to book their profits and sit out the next memory down-cycle. Of course, Micron maintains a positive view, citing that demand for memory chips will remain strong going forward on the back of applications such as the IoT and connected cars that will create demand for more cloud storage. But this doesn't guarantee earnings growth at Micron, because its rivals are going to bring more supply into the market. DRAM supply output is expected to grow as the likes of Samsung and SK Hynix build new capacity that will come online in the future. Micron bulls might point out that the two rivals have put their expansion plans on hold, for now, thanks to the emerging signs of weak pricing. But they will eventually be forced to bring new capacity to the market in order to satisfy the increasing memory demand and defend their market share. Micron plies its trade in a cyclical industry, while Sierra Wireless is going after a secular growth opportunity where it is the market leader. That's probably why Sierra's earnings are expected to start growing once again from next year after a dip in 2018, while Micron's bottom line is anticipated to be in a state of decline in the next fiscal year as well. Investors shouldn't be enticed by Micron's cheap valuation, as its earnings power may wane in the future. Sierra, on the other hand, looks like a good bet at 13 times next year's earnings, as it is much cheaper than the industry average of nearly 150 and the company's own five-year average price-to-earnings ratio of 116.